با پیشرفت دستگاه‌های دیجیتالی و هوشمند، حجم عکس‌ها و فیلم‌هایی که با آن‌ها گرفته می‌شود، افزایش یافت و دیگر مانند گذشته با عکس‌ها و فیلم‌های بی‌کیفیت مواجه نیستم؛ و نیاز به فضای بیشتری برای ذخیره‌سازی هزاران عکس و ساعت‌ها فیلمی داریم که ثبت کرده‌ایم تا بتوانیم آن‌ها را در فرصت مناسب به حافظه‌های اکسترنال و یا کامپیوتر شخصی‌مان منتقل کنیم. امروزه انواع مختلفی از کارت‌های حافظه با طیف وسیعی از ظرفیت‌ها و سرعت انتقال اطلاعات وجود دارند. در ابتدا کارت‌های حافظه با اندازه‌های بزرگتری ساخته می‌شدند ولی به‌تدریج با پیشرفت تکنولوژی اندازه آن‌ها کوچک‌تر شد و ظرفیت و سرعت آن‌ها هم افزایش یافت.کارت‌های حافظه microSD کوچک‌تر از حافظه‌های SD هستند؛ آن‌ها حافظه‌هایی با ظرفیت زیاد هستند و با پسوند SD، SDHC و SDXC نام‌گذاری می‌شوند. 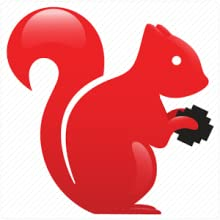 انواع استانداردهای SD، SDHC و SDXC هم با توجه به افزایش ظرفیت ذخیره‌سازی این کارت‌ها تعریف شده‌اند که معمولا تا ظرفیت 2 گیگابایت با استاندارد SD، از 2 تا 32 گیگابایت با استاندارد SDHC و از 32 گیگابایت تا 2 ترابایت هم با استاندارد SDXC تولید و عرضه می‌شوند.این کارت‌های حافظه برای دوربین‌های دیجیتال، گوشی‌های موبایل و دستگاه‌های دیجیتالی که شیار microSD را پشتیبانی می‌کنند، استفاده می‌شوند. کارت‌های microSD را می‌توان در آداپتور استاندارد آن قرار داد؛ برق مصرفی آن‌ها از 2.7 تا 3.6 ولت است.سرعت خواندن این مدل کارت حافظه برابر با 90 مگابایت بر ثانیه است. 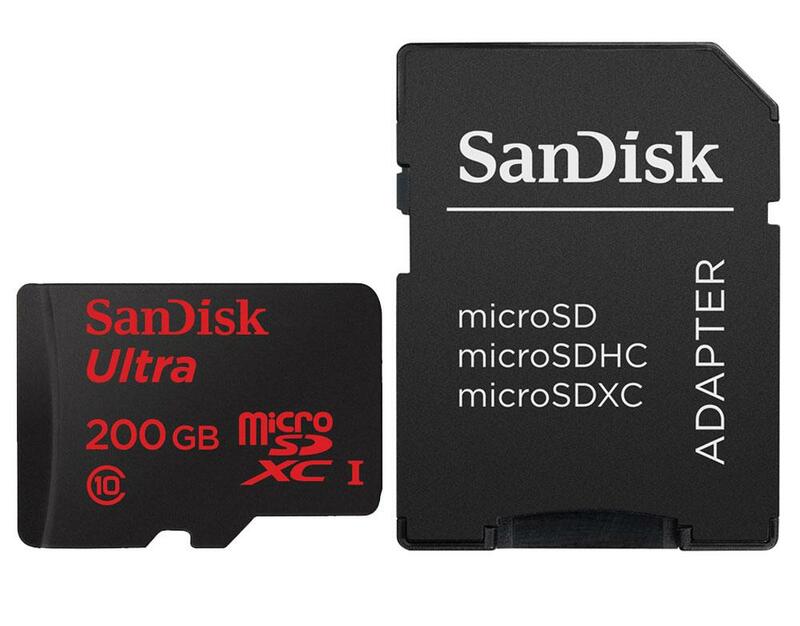 Get the most out of your Android-based smartphone or tablet with the Ultra microSDXC UHS-I Card from SanDisk – the world leader in flash memory technologies. 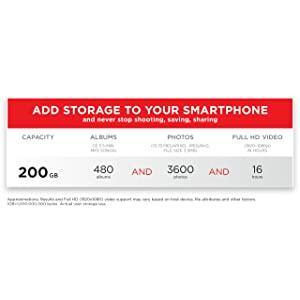 The card’s breakthrough 200GB (1) capacity allows users to store up to 20 hours of Full HD video (2), so you never have to stop shooting, saving, and sharing. When it’s time to move your data off the card, read speeds of up to 90MB/s (3) allow transfer of up to 1,200 pictures a minute (4) from card to PC. 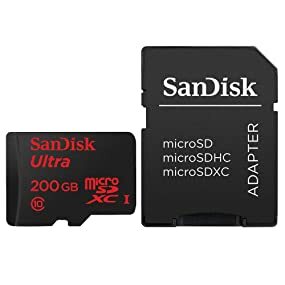 With a capacity of 200GB (1), the SanDisk Ultra microSDXC UHS-I Card offers the freedom to shoot photos and Full HD video continuously without having to worry about running out of space. Capable of storing up to 20 hours of Full HD video (2), it lets you shoot, save, and share without interruption. The SanDisk Ultra microSDXC UHS-I Card is rated Class 10 for seamless Full HD video (5) recording and playback. Capable of transferring up to 1,200 pictures a minute (4) from card to PC, the SanDisk Ultra microSDXC UHS-I Card offers blazing-fast read speeds of up to 90MB/s (3), so you can get back to creating and capturing memories as quickly as possible. 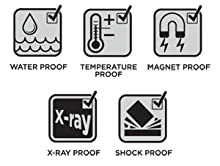 Tested and proven to work in the most extreme conditions, the SanDisk Ultra microSDXC UHS-I Card is waterproof, temperature-proof, shockproof, X-ray-proof, and magnet-proof (6), so you know your card is safe no matter where you travel. Available from the Google Play store, the SanDisk Memory Zone app (7) has over 2 million downloads and lets you view, access, and back up all your files from your phone’s memory in one convenient location. You can even set the app to move files from your device’s internal memory to your memory card automatically. An SD adapter is included to transfer files from your phone or tablet directly to your PC or Mac computer. (۱) ۱GB=1,000,000,000 bytes. Actual user storage less. (۲) Approximations; Results and Full HD (1920×1080) video support may vary based on host device, file attributes and other factors. (۳) Up to 90MB/s read speed; write speed lower. Based on internal testing; performance may be lower depending on host device, interface, usage conditions and other factors. 1MB=1,000,000 bytes. (۴) Based on 4.1GB transfer of photos (avg. file 3.5MB) with USB 3.0 reader. Results may vary based on host device, file attributes and other factors. 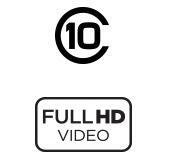 (۵) Full HD (1920×1080) video support may vary based upon host device, file attributes, and other factors. See the Sansidk website. (۶) See the Sansidk website for additional information and limitations. (۸) See the Sansidk website.